At that time we did a day trip to Valencia from our home in Vinaros. We mainly figured, that one day is too little to explore the city of 800,000 inhabitants. So we spent some hours in the city center and then decided to visit the Bioparc. For this, we decided not to visit the “Ciutat de les Arts i les Ciències” (Science and Culture Park), which includes the “L’Oceanogràfic” (aquarium). Although these two are one of the most famous landmarks in Valencia, they are located outside the city center near the port. We will visit them during our next stay in Spain. 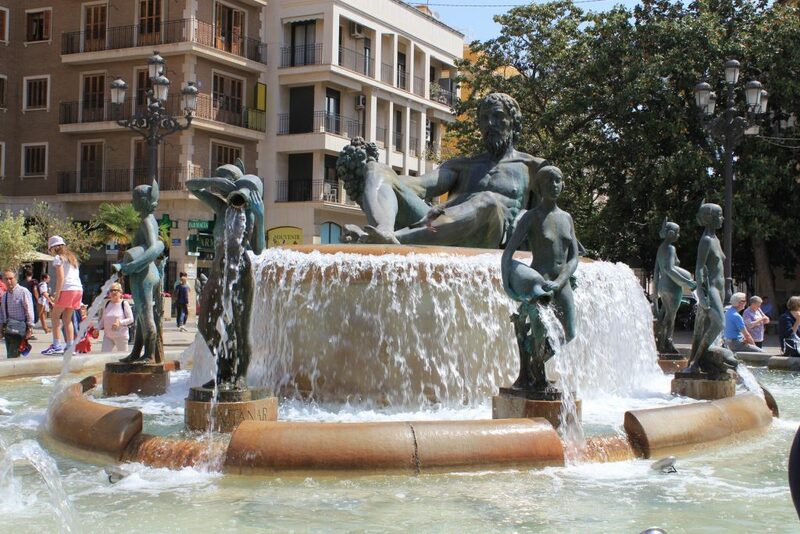 The center of Valencia brings you closer to the historical development of the city. Inevitably, you pass by the most famous buildings such as the Lonja de la Seda (silk house) or the Cathedral of Valencia. Every Thursday, in front of the cathedral, the oldest water court in Europe (Tribunal de las Aguas) takes place, where mainly quarrels between peasants from the surrounding countryside are settled. Most of the cases are about the irrigation of the fields and the distribution of groundwater. The Mercado Central is the main market of the city of Valencia, which takes place in a building that was built between 1914 and 1928. This market is one of the largest in Europe and covers an area of ​​8000 square meters. There are so many things to buy, eat and drink. The sellers are all friendly and happy to offer a taste of their treats. The only negative point: The market was so crowded (at least during our visit) that we fled after a few minutes. Bioparc Valencia replaced the old Zoo de Viveros in 2008. In the newly designed park people put much emphasis on appropriate animal housing and to give the visitor an impression of the home of the wildlife. Thus, the area is divided into different tracts, which mostly accommodate African species. It is distinguished in wet and dry savanna, African forests and even Madagascar. In the latter, even monkey bread trees were set up to provide the animals a living space as real as possible. In addition, animals that would live together in the wild are kept together in an enclosure. During our visit, the offspring of a gorilla lady had a lot of fun annoying the other apes. In addition, one of the giraffes had a cub. Otherwise, I keep the meerkats and some, previously to me unknown species in memory. But check out the pictures, they speak more than a thousand words. The beauty of the park is, that the photos look like they were taken in the wild. The admission fee is about 24 euros for an adult. This is a lot, but as long as it benefits the animals, I´m okay paying this! In addition, the zoo is concerned with the conservation of endangered species. This justifies the ticket price for me. By the way, a stay takes two to three hours, depending on how fast you are walking. Besides Valencia, we went to Barcelona, ​​Girona, Vinaros and Peniscola. You can check the posts out on my blog. I appreciate any kind of support. This can be the sharing of my articles, a nice comment or even a small donation for my work. Thank you in advance!